Its been a busy week and I haven't gotten as much done as I'd wanted. But I'd like to share where I stand. Below is a portion of the map centered on the Hooktongue Slough. As you can see the terrain is in place for south Brevoy and the Stolen Lands, including the rivers. 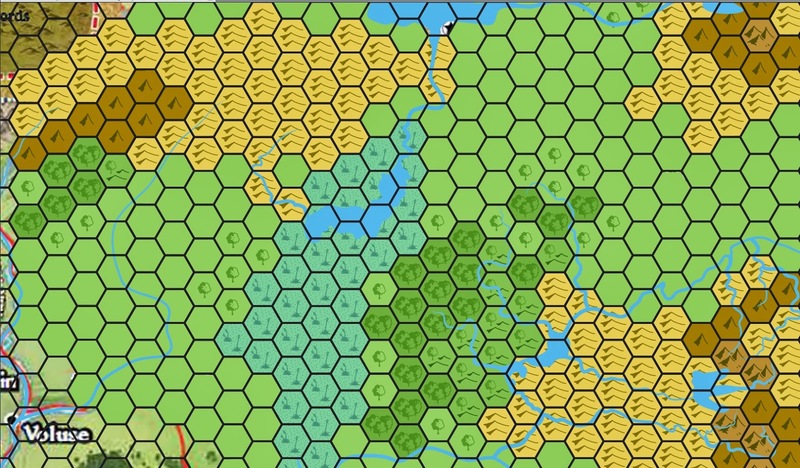 Right now I'm expanding terrain to include north Brevoy, the surrounding River Kingdoms and parts of Iobaria. The current state of the map - terrain is looking good! The symbols are mostly self explanatory. Smaller (or fewer) mountains have been denoted by the single mountain hex as opposed to the triple mountain hex. Triple mountain hexes are the particularly rugged core of the mountain chains. The same goes with forests - triple trees are dense forest whereas the single trees are lightly forested or scattered forested areas. Green currently stands for plains. I kicked around a lot of possibilities for plains, but in the end I kept to the traditional green. If you could look to the Nomen area (currently off the map) you'd find a symbol for tall grasses or savannas. This is because I wanted a visual distinction for the 'great plains' to the east that are sometimes alluded to in Paizo products. One thing I don't have a good handle on is how to make farms. I expect much of south Brevoy is farmed and i'd like to add that as part of the civilization layer (which I haven't begun on). While I'm on things that need improving, I also want to improve on the brush-strokes that create rivers. I like that the rivers naturally shrink down to nothing, but the way the rivers widen and the ultimate width of the rivers needs tweaking. I'll get to that at some point too. Its somewhere in the settings, no doubt. Speaking of rivers - the Slough. Note that the East Sellen River stops at Lake Hooktongue and doesn't continue south of the river. That's by design. The river essentially stops at the Lake and divides into innumerable channels with little to no current south of it. The current picks up again once you get closer to Mivon. If you look closely at the bottom of the map you map just be able to see the blue line starting up. Think of traversing this like traversing the everglades (although much colder). One of the things I'm looking for is a different symbol for swamp to reflect this more navigable area. There is a geological reason for this (and lots of other things), but I'm saving that for a series of subsequent posts I make describing the Sellen River and its tributaries (possibly as a travelogue). Hi John. Interesting project you have here. I can't help but get a feeling of deja vu, remembering the beginnings of my own project back in 2005, when I had similar issues and experiences as you seem to be having. It's nice to see someone putting Illustrator to such good use. Thanks Thorfinn! As someone who grew up playing Mystara I've long admired your work from afar and the encouragement is most welcome. Also, thank you for making available your hex templates. They are excellent and make my job a lot easier.